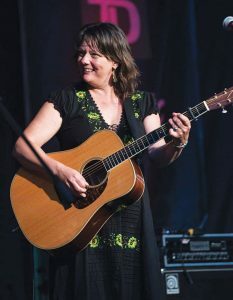 Seven years removed from her third studio album Sister of Mine, Sherry Ryan has evolved personally and professionally. Maturing as both a singer and songwriter, Ryan’s fourth studio album Wreckhouse is a deeply personal, yet addictively fun collection of 10 tracks brimming with soul and personality. Growing up in a household filled with country and Irish music, Ryan’s style is, at best, described as eclectic. Rich soulful folk and country influences mesh with a bluegrass styling known with her band Flower Hill, to a more accessible pop rock finish. The makeup of Wreckhouse contains songs written in the past six years – some even older. Though it was the loss of her father two years ago that permeates the album. Ryan’s father Jim passed away at the age of 78. A long-planned trip to Labrador, which Sherry herself had the opportunity to take after his passing, was the backdrop for the emotional and touching I Made It On My Own. The standout cut Stop the Trains directly comes from her father’s early years as a train operator on the west coast. “It was a story I often heard growing up,” Ryan recalls. “When Dad became a train operator he was stationed over on the west coast. He didn’t know about the wreckhouse winds. There was a fellow over there who would call in and let them know if it was too windy for the trains to go through. He was working at a very young age, and he gets this phone call, someone yelling ‘stop the trains!’ So, that was alarming because he was responsible. He had to phone another station in Bishop’s Falls and that’s when he found out that he had to stop the trains because they were too windy. Naturally, Wreckhouse features a who’s who of Newfoundland’s music scene. Ryan’s band includes multi-talented artists Brad Power, Dave Rowe, Brian Cherwick, Chris Donnelly, with guest musicians including Maria Cherwick on viola, Allan Ricketts on pedal steel and Andrea Monro and Andrew Laite on vocals. The album was produced by local great Don Ellis.